Imagine waking on January 1, 2017 and the cages and kennels of Talbot Humane being almost bare… Would that not be the MOST amazing way to begin the New Year? Well, our staff and volunteers are going to do our best to make this a reality for the more than 170 pets in our care at this time! Warm bed. Full belly. Love. Care. They don’t ask for much from us and what they give us in return is immeasurable. Check our social media pages, Facebook and Twitter for the Pet of the Day all month long to see and learn more about each animal. When we speak to our staff and volunteers, some of our fondest holiday memories included adding a new friend to the family during the holidays. Our lives are that much richer when we share our hearts with those who love so unconditionally. We welcome you to visit us Monday-Saturday through the holiday season, if nothing else allow us the opportunity to thank you for your ongoing support for our mission and values at Talbot Humane. We appreciate all you do, and, we know without you we would nothing. Adoption fees for felines of ALL ages waived! Saving lives is what it is all about at Talbot Humane. In effort to save the lives of more felines in our community, Talbot Humane has joined the Million Cat Challenge. This program sponsored by Maddie’s Fund, is a shelter-based campaign to save the lives of 1 million cats in North America over the next five years. The core strategy of the campaign will be five key initiatives that will offer every shelter, in every community, practical choices to reduce euthanasia and increase live outcomes for shelter cats. Diamond is one of the hundreds of deserving cats that enter our care at Talbot Humane each year. For more information on pets for adoption, the adoption process, or other services and programs available at Talbot Humane, please visit www.talbothumane.org today. 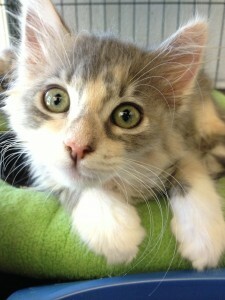 It’s All About the Felines at Talbot Humane! Due to the overwhelming number of cats and kittens still in our care, Talbot Humane has drastically cut the fees for adoptions through the end of 2014! All felines young and old, big and small have an adoption fee of only $10! 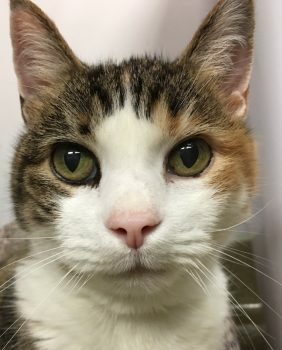 This is in an effort to help the adopters with the costs associated with a new pet- wellness visit at the vet, food, toys, beds, litter pans etc., and to help find our beloved kitties new forever homes. The application process remains the same, so apply today! The process takes 1-2 business days (often less!) 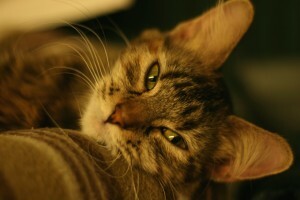 Stop by today and fall in love with one of our MANY sweet cats. Visitation at our adoption center begins daily at 11AM, or stop by PetSmart of Easton to visit with those at the Cat Adoption Center inside the store. Click here to check out our cats for adoption now! Each year this is an AMAZING day for the animals! In an effort to place the more than 200 animals in our care into good homes, we cut our adoption fees! We know bringing a new pet home is an expense when you need new bowls, litter pans, food, toys and a veterinary needs. Our goal, to help our adopters and the animals all at once! ONE DAY ONLY. These discounts are non-transferable to later date. Applications must be for an animal currently available for adoption and adoption must be completed on, or application must be submitted on August 2nd. Come out for our BowWowMeow Luau! All adoption fees have been cut DRASTICALLY! Food, door prizes and MORE! 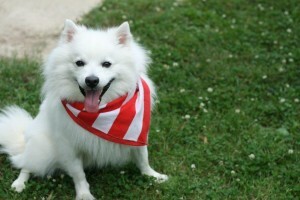 Register on August 2nd for the Bark in the Park Guinness Costume Parade and receive a $5 discount on registration fees! We hope to see you between 11a-4p on August 2nd! A Catstravaganza at Talbot Humane! With more than 150 felines in our care we need to find homes for these wonderful cats and kittens. Our hope- YOU will take advantage of this amazing opportunity to adopt! Click HERE to see our wonderful friends for adoption! This Week’s Hand Picked Cats! Remember! Hand picked cats have had their adoption fees waived, and cats featured and adopted during their hand picked week go home with a starter kit full of items needed to bring home a new feline friend! Check out all of our feline friends HERE! In honor of Independence Day and to show our appreciation for the men and women who have and continue to serve our country, Talbot Humane will be offering veterans and servicemen and women half price adoptions on all pets for the entire month of July. “We couldn’t think of a better way to honor those who have sacrificed so much for our nation,” shares Patty Quimby, Executive Director for Talbot Humane. “The gift of a new best friend is priceless.” All they need to show is military ID to receive the discounted fee at the time of adoption. For more information on the animals for adoption or to submit an adoption application click HERE. 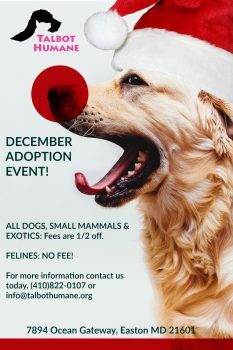 A Home for Every Animals… Adoption Fees 1/2 price through December 31st! Through December 31, 2013 ALL animals at Talbot Humane will have their adoption fees CUT IN HALF! The adoption fee is a donation toward the care of the animals while residing at Talbot Humane. Our goal, to find FOREVER LOVING homes for these wonderful animals in need. What a wonderful holiday it would be to have all of our pets in new forever homes. We hope you choose to stop by, or, share this opportunity with friends and family. When we each do a little, together we make an amazing difference for the animals. Once again T albot Humane is going CAT CRAZY with a 100 Feline Challenge to the community. The goal- to place 100 cats and kittens into new forever homes by September 30th. Waiving the usual adoption fee which ranges from $25-$75, during this challenge the adoption fee is to donate cat or kitten food to help provide care for the many cats still in need of a new home. Our cat population has remained over 200 for most of the summer. Our hope is to bring awareness to the plight of cats and kittens in our area as well as find homes for the many homeless pets waiting at Talbot Humane. All cats and kittens are altered, vaccinated, tested for FeLV/FIV and microchipped prior to adoption. So, as you can see, you are not only finding a new best friend, but, you have saved $250-400 verses that cat or kitten “Free to a good home” in the paper. For more information on one of the many pets for adoption or on how you can volunteer, contact Talbot Humane at (410)822-0107.